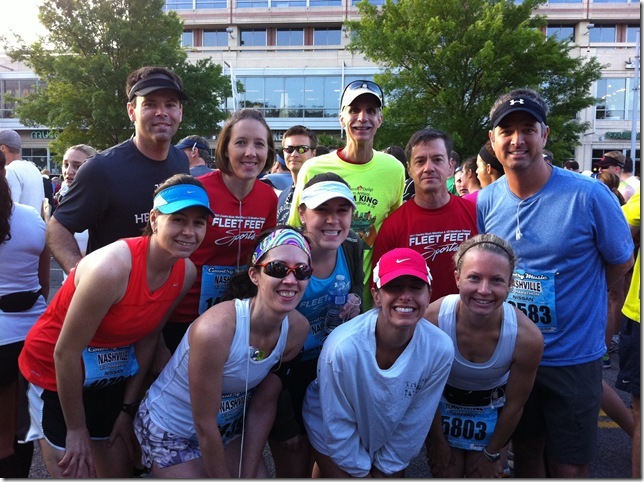 This spring I have have been working with a group from the local Fleet Feet store to pace and train a group of runners who wanted to break the 2 hour mark at the Country Music Half Marathon. On January 8, more that 500 runners met to train for the April 30 race. All the other groups were running at a particular pace, from 7:30 to 11 minutes. There were also several run/walk groups. My group was the only “goal” group. We started small but grew to around 15. Yesterday was the race. Not everyone was around when we took the picture but most of us started together. We ran a classic negative split on a hilly course. It was a thrill to see the joy and excitement as these runners reached their goal and cross the finish line with them. This entry was posted on Sunday, May 1st, 2011 at 5:23 pm	and is filed under Race Reports, Training. You can follow any responses to this entry through the RSS 2.0 feed. You can leave a response, or trackback from your own site.